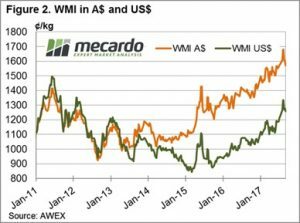 In commodities, and particularly in agricultural commodities, a stable market is generally a good sign, especially if the market is at the top of its recent trading range. The wool market can best be described as “steady” this week, however, as usual there were some exceptions with the fine wool and crossbred selections in Melbourne underperforming the market. The Eastern Market Indicator for the week remained unchanged at 1,525 cents in A$ terms, while in US$’s it fell 1 cent to 1,220 (Figure 1). Not to be outdone, the market in the west followed a similar path, rising 2 cents to close at 1572 cents. The skirtings market was by comparison erratic; gains on the first day of 10 to 20 cents were given back on the second day of selling to see this sector unchanged on last week. 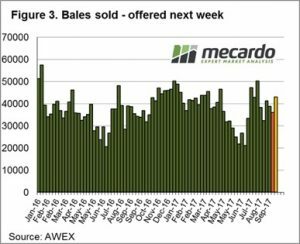 A total of 40,699 bales were offered for sale this week. The steady market encouraged growers to more readily meet the market, with the pass-in rate of 6.9% well down from last week’s significant 15.5%. (Figure 3). 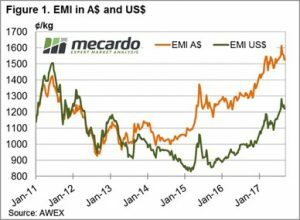 In regards to the Melbourne fine wool market performance, this was affected by an increasing prevalence of wool exhibiting higher mid breaks. To emphasise, AWEX report that wool with less than 20% mid breaks found increased competition and greater premiums. A total of 41,483 bales are listed for sale next week across the three selling centres. This is consistent for the next three weeks as the early spring shearing rolls into stores. The market has been a bit “bouncy” up to this week, we wouldn’t predict either stable or unstable for next week, its “one of those times” in the wool market!